In June 1965, the Board of Regents of the University System of Georgia authorized a junior college for the west metropolitan area of Atlanta at an undesignated location. After a great deal of discussion, the Atlanta School Board and the Board of Regents made the decision to build the College on land adjacent to Atlanta Area Technical School, which was under the jurisdiction of the Atlanta Board of Education. The Atlanta School Board authorized their Superintendent in February 1971 to develop a financial plan to build the new college. On October 9, 1972, the Board of Regents reconfirmed, in principle, the construction of the college. In February 1973, the Board of Regents authorized the plans and specifications for Phase I of the construction at a projected cost of $2,000,000. Construction began on the first building in 1973 and was completed in August 1974. The College became the thirty-first institution of the University System of Georgia and began classes in September 1974 with an initial enrollment of 504 students. The College, Atlanta Junior College, was accredited in 1976 by the Southern Association of Colleges and Schools (SACS). During the 1976-77 academic year, construction of the Central Energy Plant was completed. In 1978-79 two multi-level academic buildings were added to the resources of the College: an academic classroom building and the College library. The 1987-1988 academic year brought the decision to change the institution's name from Atlanta Junior College to Atlanta Metropolitan College (AMC), with the permanent transition becoming effective July 1, 1988. A new Health and Physical Education Complex was completed and occupied during the 1991-92 academic year. Additionally, the Student Center was completed during the fall 2000 semester. Fall 2009, Atlanta Metropolitan College opened its first instructional site at 34 Peachtree. 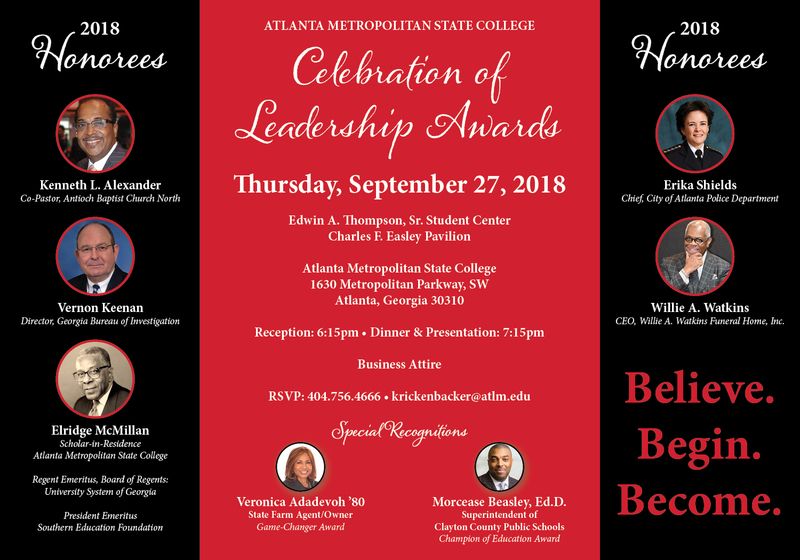 On May 10, 2011, the Board of Regents approved a substantive and mission change for Atlanta Metropolitan College to move from Two-year college status to that of a State College. In its December 2011 annual meeting, SACS followed this action by approving an AMSC status change from a Level I to Level II institution, which authorized Atlanta Metropolitan State College to offer four-year programs and the bachelor's degree. In spring 2012, the Board of Regents of the University System of Georgia approved the name change of Atlanta Metropolitan College to that of Atlanta Metropolitan State College (AMSC). Atlanta Metropolitan State College (AMSC) has four academic divisions: (1) Business and Computer Science, (2) Humanities and Fine Arts, (3) Science, Math, and Health Professions, and (4) Social Sciences. Each division is headed by a Dean, who, with the assistance of department heads, is responsible for the administration and management of the academic divisions. Deans report to the Vice President for Academic Affairs, who in turn reports to the President of the College. There are also five Vice Presidents (VPs) of the College, one for each of the following areas: (1) Academic Affairs, (2) Fiscal Affairs, (3) Institutional Advancement (4) Institutional Effectiveness, (4), and (5) Student Affairs.